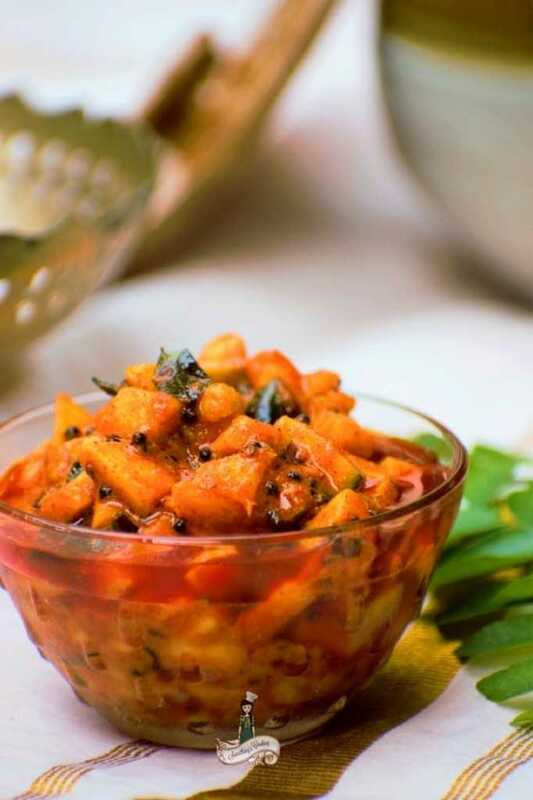 Spicy, flavorful, aromatic and definitely mouth-watering Kerala Style Mango Pickle is ridiculously easy to prepare. Sour raw mangoes and gingelly oil are the main ingredients that give the pickle its unique flavor. 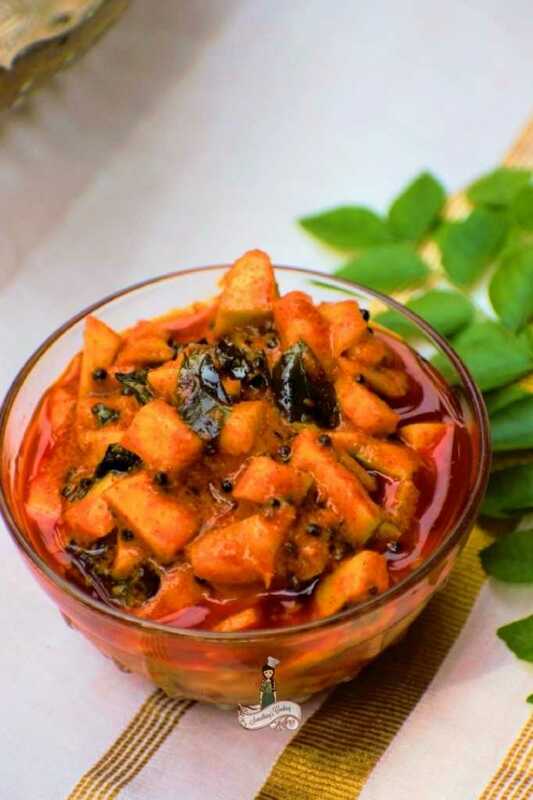 Maanga curry or Mango Pickle is an important dish served in a traditional Onam/Vishu/Kerala Wedding Sadya. It is one of my absolute favorite and the mere thought of it makes me drool. 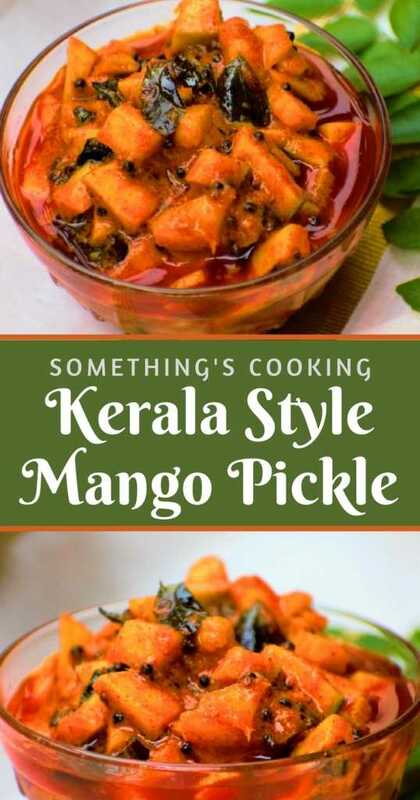 There are different ways to prepare a Mango Pickle in Kerala Style. This is how my Amma makes and it is pretty simple to prepare. And of course, this IS prepared by Amma and the pictures were clicked when I had visited home last September. I was browsing through the pictures today and these sinful pictures reminded me of posting the recipe. 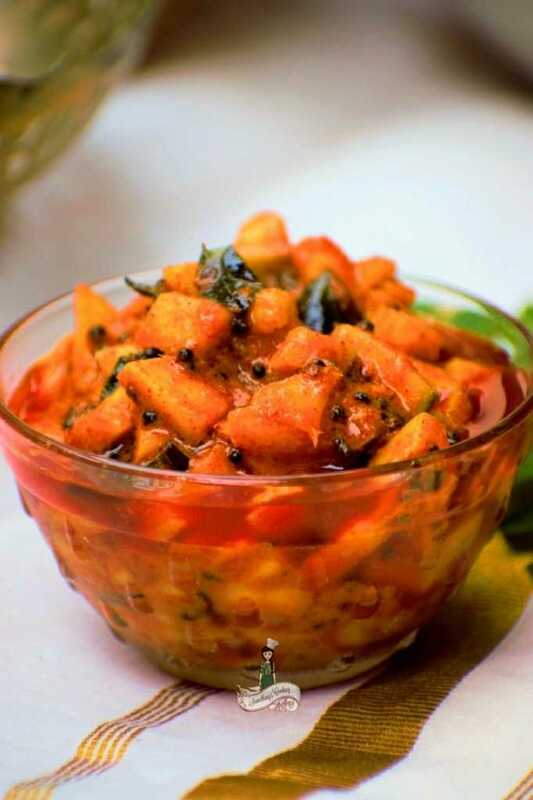 Mangoes are in season now and also, today on April 22nd we are celebrating Aam Achaar Day (Mango Pickle Day) nationwide. 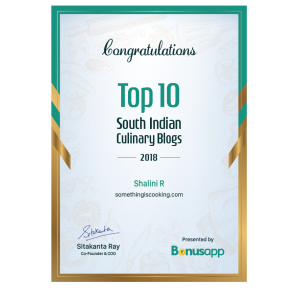 Rushina Munshaw Ghildiyal, founder of APB Cook Studio, had come up with this special day last year in 2017. Since sticking to only mango pickles was kinda limiting, this year it has been extended to Achaar Day. I confess that I don’t usually make pickles at home. I pick up my favorite brand of pickles from the supermarket. But when I visit Amma she makes these sinfully delicious ones and I go crazy. 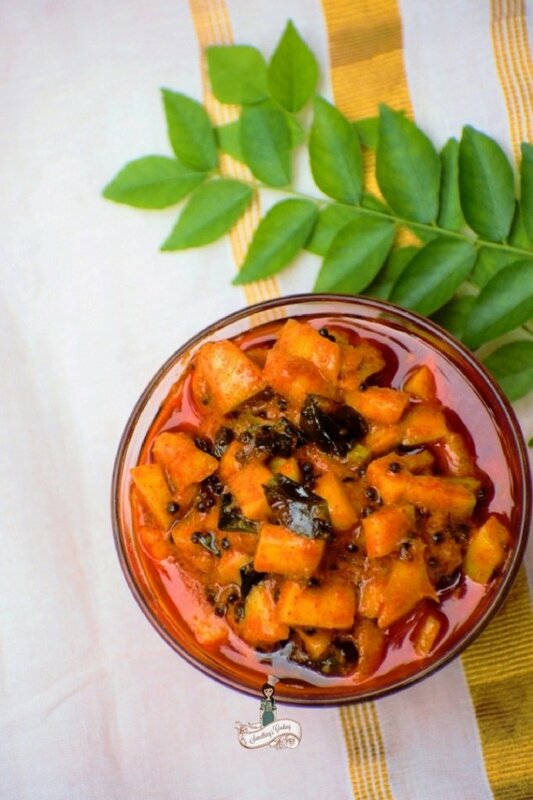 This raw mango pickle is also called Kadumaanga achaar in Malayalam. I thought pickle-making was a hectic job but believe me, this is easy and I will definitely prepare it this mango season. Add salt and 1/4tsp asafoetida to the chopped raw mango. Mix well and set aside for 6 hours or overnight. Next day, heat gingelly oil in a pan. Add mustard seeds. When it splutters, add ginger, garlic, green chilies and curry leaves. Saute for a couple of minutes. Keep the flame in low and add red chili powder, turmeric powder, fenugreek powder and the remaining asafoetida. Mix well and saute for a couple of minutes. Remove from flame and add to the 'marinated' mango. Mix well. Serve immediately or store in an airtight container in a refrigerated upto a week. You can add a few tbsp of vinegar while sauteing the spice powders. Also add half a cup of water and let it boil. Adding this would extend the shelf life of the pickle. Leave the skin on so that the mangoes remain crisp and not soggy. Like it? Don’t forget to pin it! One of my favourite pickles to make and eat! Onam sadya and Vishu is incomplete without this. A universal favourite at home 🙂 Husband finishes the whole bowl! I used to think making pickles was a cumbersome task but this is the easiest pickle recipe I have come across! Will be sharing it with my pickle loving friends. Oh this is so yum. My mom in law makes this every mango season and I just freak out on it. It looks mouth watering. It sounds so simple. I will try it out. I’m going to try my hand at this one! I love making pickles. The chilly one is the regular in my home apart from lime and mango. I make both instant pickle and the long lasting one. This looks absolutely delicious. Mothers make the best pickles after all. Roti and amm ka achar… Oh so yumm. This looks amazing… I can already smell it. The recipe isn’t too tough. Can gingelly oil be replaced with something else?